Tens of thousands of visitors are expected to look on when dozens of ponies make their annual swim from Assateague Island to Chincoteague. The 88th edition of the spectacle celebrated by Marguerite Henry's 1947 novel "Misty of Chincoteague'' will be staged Wednesday on the Eastern Shore. 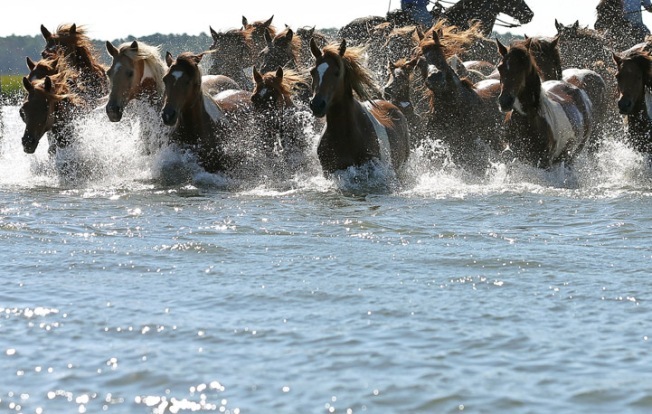 The so-called Saltwater Cowboys have rounded up approximately 150 ponies that live on Assateague for the swim. After the swim, the ponies are rested before they're paraded down Main Street. Each year the wild ponies are auctioned to raise money for the Chincoteague Volunteer Fire Company, which cares for the Virginia herd.